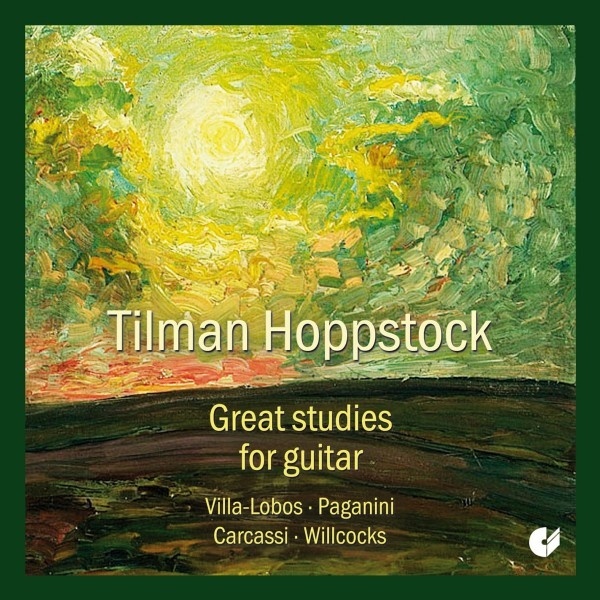 Great Studies for Guitar (Tilman Hoppstock) - VILLA-LOBOS, WILLCOCKS, PAGANINI.. Which of the major studies for guitar should be chosen for a selection with an overall duration of slightly under 80 minutes? Although the 24 Caprices by Niccolo Paganini (1782-1840) were not originally written for the guitar, three of these pieces have been included in this recording as they test the borderlines of numerous aspects of guitar technique. In contrast, the English impressionist Allan Willcocks (1869-1956) is a rather unknown composer whose complete 12 studies have never before been recorded on CD. The collection of studies by Matteo Carcassi (1792-1853) effectively represents the foundation for the guitarist‘s training. The CD culminates with the famous study cycle by the Brazilian composer Heitor Villa-Lobos (1887-1959): a work of equal signifycance for guitarists as Chopin’s Studies for pianists. Tilman Hoppstock (b. 1961) has visited over 40 countries on his concert tours as a soloist and with chamber music ensembles. Twenty CDs document his extensive repertoire. In addition to his teaching posts at the Musikhochschule in Mainz (1985-2007) and the Akademie für Tonkunst in Darmstadt (since 1988), he accepted a two-year guest professorship (2004/05) at the University of Piteå (Sweden). Tilman Hoppstock gives regular master classes and specialist seminars and has followed invitations from institutions such as the Royal Academy in London, the Manhattan School of Music in New York and the University of South California in Los Angeles.